Three elephants from the Toronto Zoo are moved to a sanctuary in California. Toka and Iringa “roamed with their families in the warm, dry climate of southern Africa” before they were “captured and brought to a zoo in Toronto, Ontario, Canada.” Thika, 10 years younger, was born at the zoo. The matter-of-fact, accessible text makes it clear that these monumental creatures were headed toward early deaths due to the combination of harsh weather and the stultifying zoo environment, triggering the transfer. 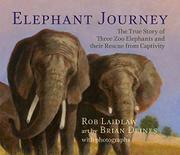 Beautiful oil paintings with the softness of pastels—all double-page spreads on generously sized pages—capture important moments in the story: the different settings of southern Africa, zoo, and wildlife sanctuary; the excitement of protestors who finally convince authorities to transport the elephants to the Performing Animal Welfare Society; the convoy of trucks from Toronto to California; and many intimate moments among elephants. Particularly poignant: Toka has shyly moved from her transport crate to the PAWS elephant barn, where three resident elephants stand behind safety barriers. The elephants trumpet and wave their trunks at the newbie: “It was as if the elephants were old friends who had been reunited at last.” There is quite a bit of repetition in the endnotes but also further details, including a recounting of the two years following the successful 2013 transfer.